Camp Quinebarge prides itself on providing a wide range of sports activities. Whether you are playing a doubles tournament on our beautiful clary courts or learning to hit a bullseye on our archery range, Quinebarge has something for everyone. 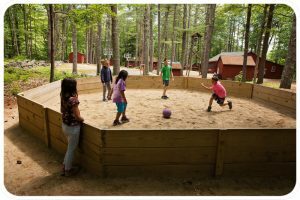 We hear from our campers that the wide range of sports offered, including soccer, lacrosse, ultimate frisbee, kickball, street hockey, basketball, laser tag, frisbee golf, volleyball, gaga and so much more, along with the noncompetitive atmosphere Quinebarge provides helps makes Camp Quinebarge the best sports camp in New Hampshire. 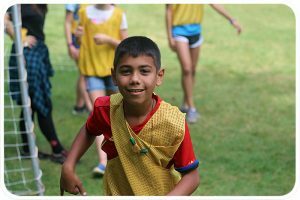 At Camp Quinebarge, we hear from our campers that they love how many sports options there are at camp. In the morning you could play a game a kickball and then in the afternoon play a fun game of soccer. Our staff are mostly college athletes who teach our kids the basic techniques they need to be successful at the sport. Every activity includes a little of instruction, some moderated play, followed by full play. The Adventure Program at Camp Quinebarge is one of the best facilities Quinebarge offers. 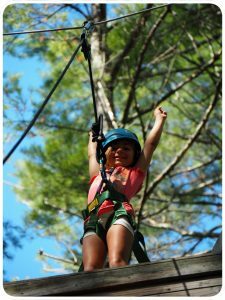 We provide a low ropes course, high ropes course, zipline and climbing wall. Campers progress through the courses over several days learning teamwork, communication, cooperation and trust. Our staff are specially trained to ensure that our campers completely these challenges safely. 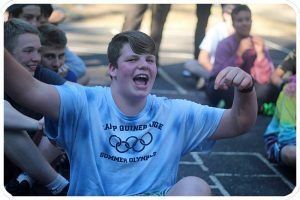 At Quinebarge we want our campers to compete to have fun. We focus on skill development, play and fun and while one team or another may win, we leave that on the field and gather together as friends. Quinebarge is for sports and fun and many campers believe that makes for a great New Hampshire sports camp.